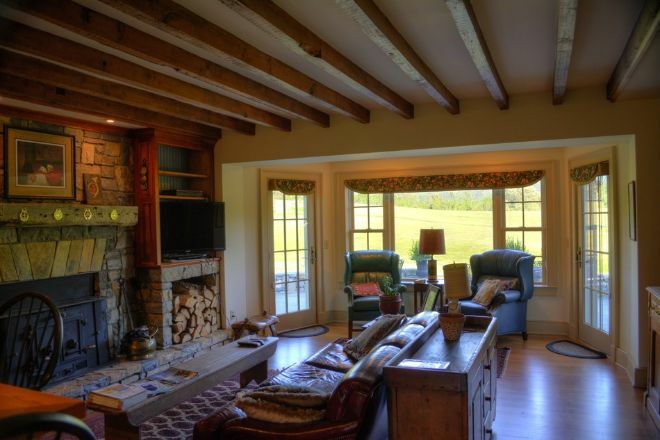 Hidden away in a secluded area at the base of the Blue Ridge Mountains lies Hidden Valley Farm, a beautiful and expansive property that is firmly rooted in its area's history. 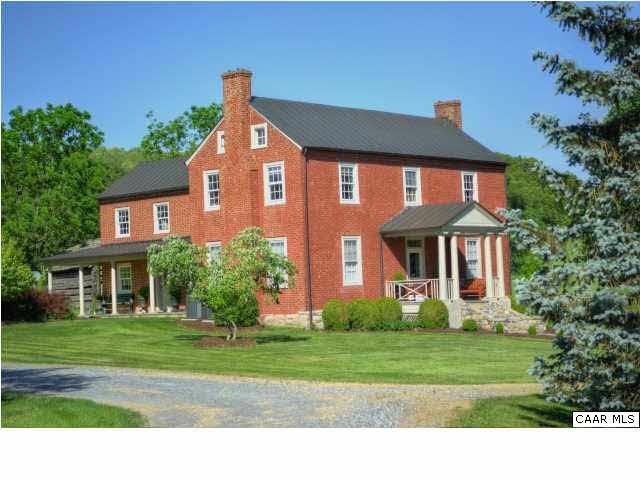 Rumored to have been the home of the father of inventor Cyrus McCormick, this Virginia house has all the advantages of the idyllic countryside while still being relatively close to Washington, D.C. 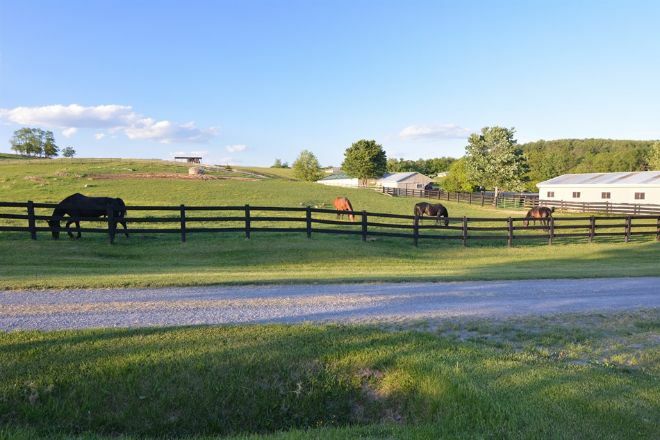 This pastoral wonderland includes over 430 acres of pasture, crop fields, forest and land that is dedicated to the historic farmhouse and its outbuildings. 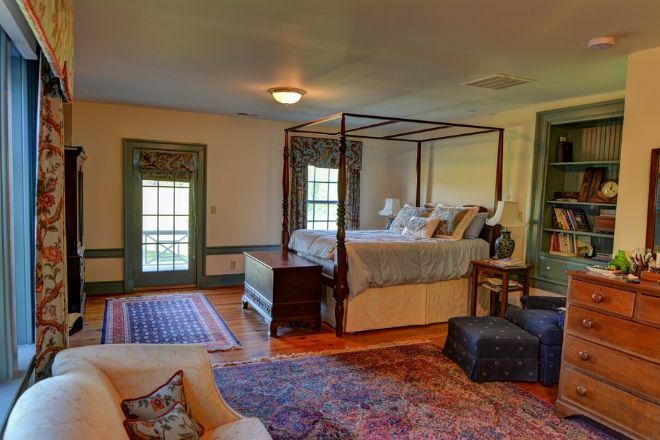 Due to the loving care of the home's past owners, the farmhouse has been updated to include modern technologies and luxuries, while still maintaining the historical character of the home. 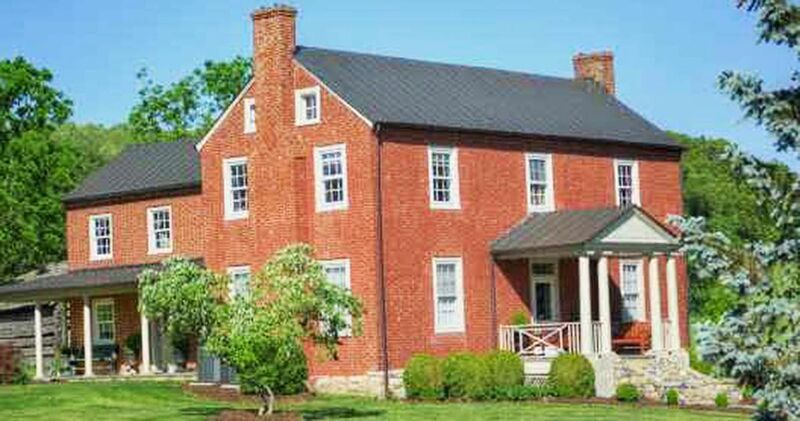 The farmhouse itself features Flemish-bond brickwork, a hallmark of traditional Virginia construction. In addition to the original structure, an addition has also been constructed, to create the kitchen, office and master bedroom and bathroom. 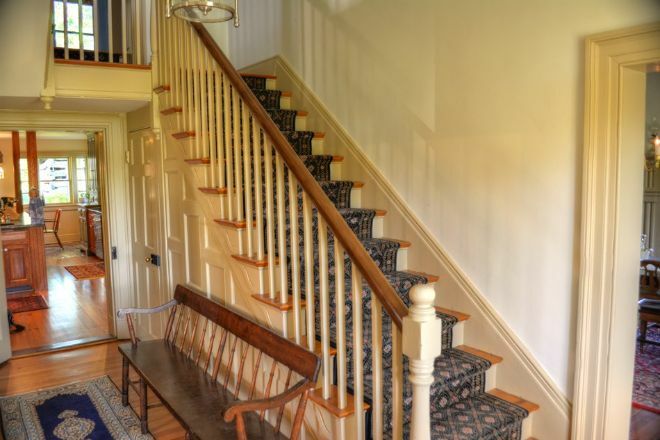 The foyer of the farmhouse opens into a hallway replete with gleaming hardwood floors, intricate wall paneling underneath the staircase and gorgeous antique touches. Rustic exposed beams highlight the high ceilings throughout the home, while stonework and masonry accent each of the six fireplaces throughout the house. The fully updated kitchen is hugged by a full breakfast bar that is near enough to the fireplace to stay warm and toasty while sipping your first cup of coffee in the morning. 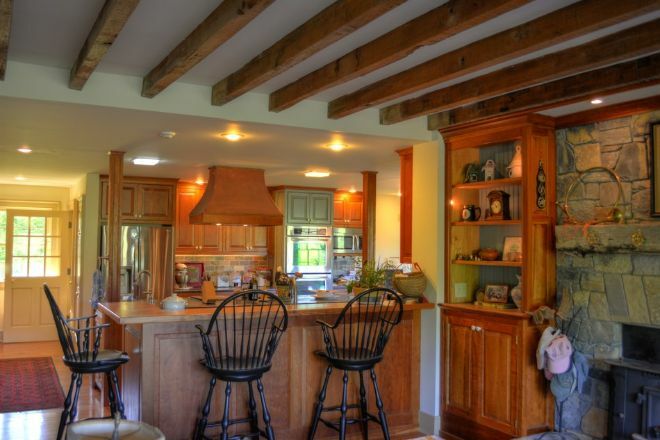 Hardwood beams frame the kitchen island, which includes both a sink and range. Other modern appliances featured in this kitchen are a stainless steel refrigerator and two ovens. The hardwood flooring of the cooking area then gives way to rustic stone flooring in an adjoining dining nook. The farmhouse's formal dining room is resplendent with its delicate chandelier and classic molding around the fireplace. 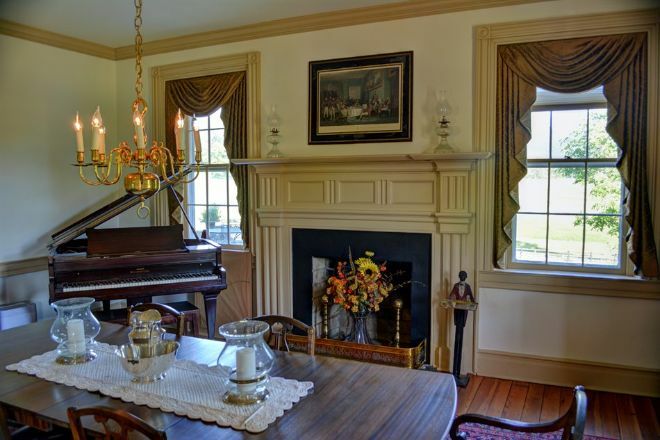 Antique accents such as oil lanterns on the mantel serve to further highlight the home's historic background. A piano in the corner of the room finishes this effect, evoking images of dinner parties from yesteryear. The sitting room is a luxurious area accented with both exposed hardwood and hearty stonework and masonry that surrounds the wood-burning stove. Leather furniture, in combination with these classic and antique accents, gives this room the effect of a hunting lodge or ski resort, where you can warm up after a chilly day outside. The bay window, complete with two wingback chairs, finishes off this cozy look. A four-poster bed is the showpiece of this master bedroom, the largest of three bedrooms, which is full of light from its multiple windows. For the avid reader, a charming bookcase is built into the wall and a comfortable chair sits beside it. More hardwood accents and vintage area rugs complete the room. 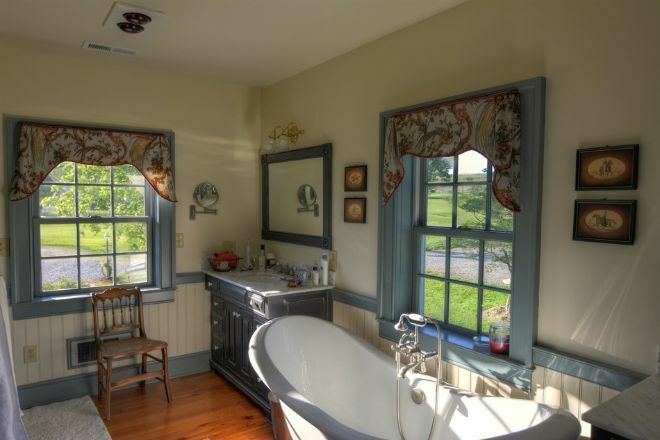 Cream-colored wainscoting and blue trim combine to create a soothing, relaxing atmosphere in one of the main bathrooms. The deep clawfoot bathtub allows for decadent bubble baths after long days. From this historic home's front porch, you can enjoy the view of its immaculately manicured front lawn, with rustic stone accents and well-maintained greenery. 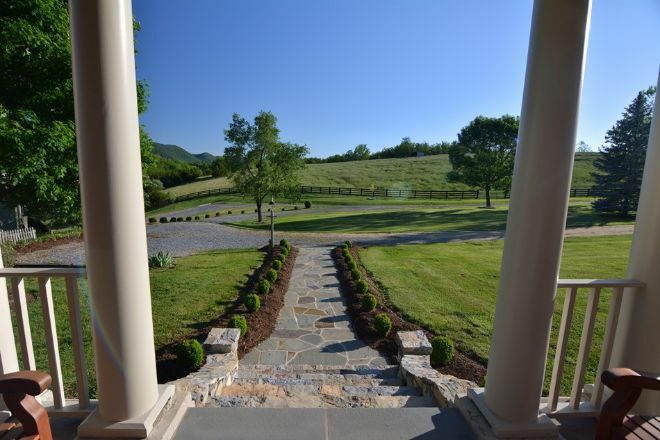 Beyond the lawn lies just a small portion of the property's expansive and beautiful land. The back of the property extends out to the banks of the South River, so fans of the outdoors can enjoy their own private fishing spot. In addition to this undeniably charming farmhouse, Hidden Valley Farm also includes a guest cottage, a three-bay garage with a complete apartment on the second floor, several farm-related outbuildings and even a traditional barn that has been converted into an entertaining space. 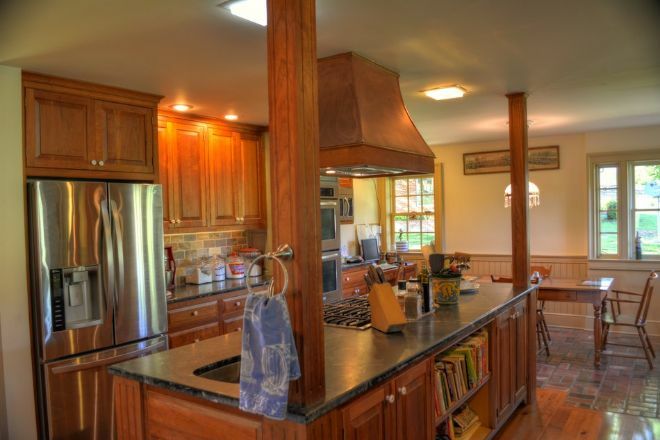 This refinished barn is ideal for parties and weddings and is even outfitted with a bar and chandeliers. Sounds like a dream come true? Share this amazing home with your friends!